From the darkest of places, comes a story of healing and hope. 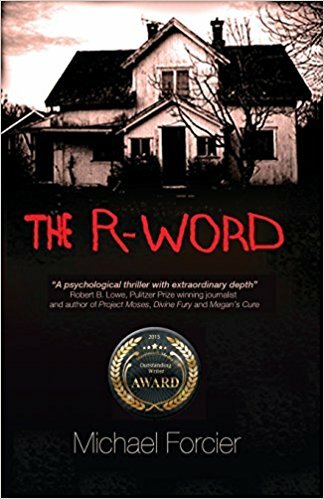 In his debut novel, The R-Word, Michael Forcier deftly creates a suspenseful story of a young man’s ability to retain his dignity and human kindness, under horrendous circumstances. We follow story of Zachary Chandler, a young man adrift in life, struggling with the complexities of sexual identity and hindered by subconscious guilt. After a night out at a bar, he wakes to find himself locked in a cage in an ominous basement. Along with two other captives, he is forced to endure torture and other abuses while striving not only to stay alive, but to maintain a sense of humanity. The key to both lies in the help of an autistic boy languishing upstairs. I think I’ll start from the beginning and I have to honestly tell you that at first I was really not able to get the story. And it happens to me at the start of a novel where I don’t know when the story is taking place and what’s happening? It was a bit slow at start but after about 20 pages the action began. Zac, the protagonist, is offered a drink by a somewhat friendly stranger and he drinks it. And then he finds himself in a basement of a house. Trapped with two more people. He doesn’t know how he came here. He has to get out. He struggles to find a way out but a man comes before he could do that. His name is Dogcatcher. A sort of a nickname given by his friends long ago. I tried to remember something-anything. Nothing came. The process was like trying to evoke a dream that had escaped my grasp, but which lingered in wisps of sublimated haze. Then starts the assault. The man beats him and he is always left in pain. But he is given proper food everyday and proper towels to wash himself. It’s like he is made ready to be beaten. I didn’t know which was worse, being stalked by an unseen predator or befriended by one. This is a story of self acceptance and bravery and friendship. In the time he is alone, Zac, ponders over many things he did wrong and never apologized, how he loved his mother but never said so. How he wished he had said everything to everyone when he had time because now he felt he was going to die. He couldn’t take up the beatings anymore. How will he get out? Over will he ever get out? Will he ever be able to tell his mother that he loves her? You can only know this if you read this. I finished this in half a day. As I got more involved in the story I wanted to know what is going to happen next. The writing style was good. I was able to read it in a go and I never thought of leaving it because the suspense pushed me to read ahead. The characters were easily relatable and the main character showed bravery in his acts and his friendship with Dogcatcher’s mentally challenged brother Derrick is well said. Overall I enjoyed reading it. Though it might seem a bit complex to some but I got to read a book with a story I’ve never heard if before. And it was somewhat different from the regular thrillers. So overall I think I can give it 3.5 stars out of five. A big thank you to the author himself, Michael Forcier, and also Bostick Communications for providing me with this ebook. Check out The R-Word here. Guest review contributed by Vrushali. Vrushali reads books like people eat food. As an aspiring writer, she enjoys examining the form of writing when she reviews books. Next Post Poll: What New Genre Are You Most Willing to Take a Chance On?